Try Our Revolutionary Air Conditioning Drain Pan Cleaner. 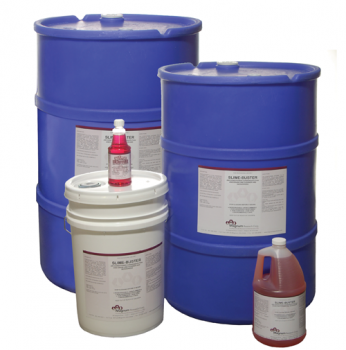 Slime Buster™ is a truly revolutionary combination of chemicals and deodorizers designed to clean scum, slime and other accumulations in air-conditioning condensate drain pans and lines, water fountain drain and humidification systems. This unique product will eliminate clogged drains, pans and obstructed humidifier drains and reduce unpleasant odors. Regular maintenance with Slime Buster™ will prevent overflow damage and unnecessary maintenance repairs. Remove clog if necessary prior to initial application. Simply pour 8 oz. of Slime Buster™ into air conditioner drain pan or drain line. Start air conditioner after 20 minutes. For best results repeat application every 30 days. Larger systems may require additional Slime Buster™. Pour 4 oz. of Slime Buster™ directly into water fountain drain. Repeat procedure monthly to keep drain free flowing and deodorized. For small systems add 4 oz. directly into pan or drain.